For 361 days a year, Monaco is best known for its casinos and the headlines made by its Royal Family. 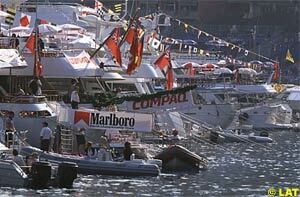 But for four days, it becomes the fast-moving crowded city that holds the Formula One Monaco Grand Prix. Former Monaco resident Pascal Straatsma reveals the action that takes places behind the cameras. This is a fine weekday morning in spring, and the city is still asleep since today is Ascension, a religious holiday. Suddenly, it feels as if an earthquake is shaking the whole place, as thousands of horsepower are being unleashed at once. The noise reverberates on the nearby mountains and this moment marks the beginning of four crazy days, when the city becomes the scene of one of the best-known sports events in the world. The first free practice of the Monaco Grand Prix has just started. Monaco is probably one of the most recognised names around the world. For some people, the city lives for, and from, its casino and the huge sums of money played there. For others, the Royal Family and its glamour life detailed weekly in the tabloids are the main attraction. But for us Formula One enthusiasts, this place is mainly the stage of one of the major venues in the calendar. 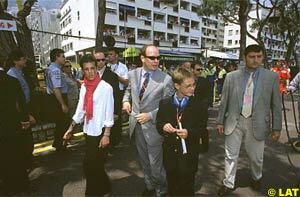 For years, my privilege has been to add another definition to the mix: Monaco was my home, the place where I grew up. And because of that fact, I have been lucky enough to get familiar with the behind-the-scene aspects of the Grand Prix. 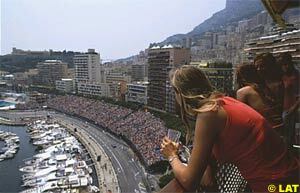 Seen from a distance, the Monaco Grand Prix seems like a four-day event. The reality is a bit different, as it is actually a four-month annual marathon for the many people involved in the organisation. It starts a little over two months before the actual race, first at night when in the span of only a few days, one third of the circuit gets resurfaced with fresh tarmac. This way, F1 cars don't have to run on a track more than two years old in its oldest parts. Then, the process accelerates with an army of workers setting up grandstands and kilometres of guard rail all around the track. For Monaco residents and tourists alike, this can be a real hindrance since parking spaces, already scarce in normal circumstances, becomes almost impossible to find. The Automobile Club de Monaco, which supervises the whole operation, faces the tough task of starting this construction work as late as possible while still running on schedule. At the same time, it also has to make sure that the hundreds of marshals, coming from all over France, are properly trained for the unique conditions of the Monaco event. This requires several training sessions, with some of them using a dummy F1 car to get everyone familiar with what they are likely to encounter if things were to go bad during the race. Many of the people I met who once went to the Grand Prix as spectators told me about the unique atmosphere of this event. Of course, Monaco is all year long a place where luxury is shamelessly conspicuous. But among the 30,000 reported residents, millionaires still remain a minority. But amazingly enough, all excess seems to become possible once the Grand Prix is included in the picture. The Principality then becomes a car-spotter's heaven, with the products of Ferrari, Aston Martin and Porsche seemingly parked at every street corner, and many celebrities rush in to be part of the show. But there is a downside for many people. First of all, some of the drivers probably find the change bothering, since the tranquillity they usually enjoy when having the Principality as their home suddenly goes missing. It is often written in the press that drivers move to Monaco for tax evasion, but it is not emphasised enough that many of them stay there because they are spared from the effects of the so-called star system. It's not a rare occurrence to spot Mika Hakkinen having a beer with his manager Keke Rosberg in a trendy cafe, or David Coulthard pushing a shopping cart at the local supermarket, and this kind of sight hardly raises an eyebrow among residents. But during the duration of the Grand Prix, drivers usually try to keep as low a profile as possible, as their semblance of anonymity is obviously destroyed by the hordes of fans invading the city. The latter also deter a large minority of local residents from staying. Not surprisingly, Monaco becomes a happy mess where simply driving a car is a task that requires a lot of time and patience, even at night. And besides, many people can make a good chunk of money by sub-renting their apartments at an outrageous price for the duration of the event. This becomes a business, and Monaco's financial prosperity came mostly from its inhabitants' ability to take advantage of a business opportunity when they saw one. The majority of residents staying home can look forward to a very exciting week though. Firstly, little signs hint at the slow build-up of tension during the final stage of the countdown, like Marlboro flags popping up on most shops. Monaco is still one of the very few places where tobacco advertising is not regulated at all, and advertisers take full advantage of that situation, giving a further boost to local business. Then the teams start coming in. The first vehicles usually arrive by Monday, and by Tuesday evening, everything is in place in the paddock. Traditionally, access to the latter was free on Wednesday to allow the local kids to visit, but with the recent wave of secrecy engulfing Formula One, seeing the cars has sadly become a near impossible endeavour nowadays. Spotting drivers is also pretty much a thing of the past, though the occasional rookie might be caught visiting his mechanics. And while top teams still enjoy the harbour side luxury of parking their motor homes on Quai Antoine 1er, lesser teams have to make do with the P�cheurs covered parking structure as their base. Sadly for them, none of their members needs sunscreen in this place. Spectators usually start coming in by Wednesday evening, and places such as Casino Square, or the former Loews Hotel become home of the finest automobiles on Earth. Meanwhile, in the recent Fontvieille quarter, things are getting hectic at the helicopter pad. It is an amazing sight to see a dozen of these machines hovering over the sea, waiting for their turn to land and disembark their wealthy passengers, most of them arriving directly from Nice airport. I said wealthy because the already expensive price for the link gets increased threefold for the duration of the event. But for many visitors, showing off is the name of the game. Then comes the racing. Some people may remember the pre-qualifying sessions of the early eighties, and this usually meant a very early wake-up call for the Principality. For anyone who hasn't been at a Grand Prix, it is impossible to imagine how loud a Formula One car is, and within an urban environment such as Monaco, this is the closest thing to an explosion. These days, the first practice session now starts later in the morning, but the effect is nevertheless startling. For a whole day, part of the city becomes a playground and the rest of it tries to keep functioning. Bus lines have to choose different routes, and most shops are open despite the holiday. Grandstands are still half-empty, and already Monaco seems crowded. But this is only the beginning. On Friday, things initially seem to quieten down a bit. F1 cars are confined to the secrecy of the paddock, now closed to visitors, and other racing series own the track for the morning. A more relaxed atmosphere can actually be felt, helped by the fact that grandstand access is free that day. But this is a short moment of quiet before the storm, as more people pour into the Principality. By this time, driving a car becomes a really bad idea, and most locals have switched to using a motor scooter, and predictably the place becomes one giant traffic-jam in the evening. Some people start to set-up tents between the bushes on the slopes of the Rock, and the sound of their inebriated banter usually can be heard until late at night. On Saturday morning, the place becomes a racetrack again. And respect has to be given to the Automobile Club people in charge of the thankless task of driving away the many people sleeping behind guard rails or in the grandstands, hoping they could remain unnoticed until the race cars started their show. This is the start of a very long day because, besides the F1 practice and qualifying sessions, takes place the F3000 Grand Prix late in the afternoon. Speaking of this, this race replaced the F3 event a few years ago, and I have funny memories associated with the latter. Due to lack of space, Formula Three teams were housed next to the Monte-Carlo Country Club, home of the Monte-Carlo Open tennis tournament. The problem is that this place is pretty far from the actual track, so F3 cars had to drive through the city before and after the race, and that in the middle of regular traffic. This is actually the only kind of instance I can think of when people driving their car on a public road run a chance of being overtaken by an open-wheel racecar. And though I haven't witnessed it with the F3000 cars, I have no reason to think the same thing does not happen nowadays as it did ten years ago. Once this race is over, the track becomes flooded with people in only a matter of minutes. This lasts until very late at night as most visitors want to take full advantage of the experience of being where, only hours before, their idols were skillfully driving their cars millimeters away from the rails. Sunday is of course the climax with the much-awaited Grand Prix. The grandstands are now packed with people, and so are the slopes below the palace. For these spectators, this might be a lousy way of watching a race, but on the other hand they get the full aural experience. And most of them carry a good set of binoculars anyway, handy to spot the cars, but also useful to see the many half-naked women baking in the sun on the yachts moored in the harbour. Speaking of which, I wish to let you in on a little secret. Every year, I see comments from people getting overly excited over the somewhat tame shots of women in micro bikinis shown on television before and during the race. Well, for the people working in the pressroom, this sideshow starts hours before the actual race, when TV cameramen test their equipment. Knowing that their feed will not get transmitted beyond the television closed circuit of the Automobile Club, they seem to start a frantic hunt for naked women, and sure enough they find some, on which they can try the full resolution of their zoom lenses. I can therefore testify that journalists present in the pressroom are spoilt compared with the average viewer. I won't talk about the race itself, as I wouldn't be able to tell anything out of the ordinary. Some people love it, and others think it belongs to the past. But judging from the attendance, Monaco is still a very popular event, traditionally drawing a large crowd from nearby Italy, and more recently a lot of people from Germany. But once the race is over, it only takes a couple of hours for these people to leave the Principality. Grandstands are left standing like useless skeletons, and tons of trash under them have to be disposed of. Teams will be leaving later in the evening, or early the following morning, and Monaco will become again the place it is 361 days a year. But for the Automobile Club, the marathon is far from over, as everything has to be removed before the summer season starts and another kind of tourist invades Monaco. Business never stops there. Just ask David Coulthard the next time you see him pushing a shopping cart.